Your Humble Narrator is presently sitting aboard a train from London to Glasgow, in the first-class compartment. First class doesn't cost all that much when booked in advance, and has privileges, not least among them free wireless internet throughout the four-and-a-bit-hour journey. The quality of the internet access is mostly usable, though somewhat patchy; speed is, from memory, comparable with dialup, and long file transfers (such as Flickr photo uploads) sometimes time out; other than that, the service is quite usable. 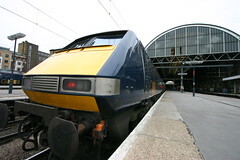 The other benefits of GNER first class are somewhat fewer than they were on Virgin: a GNER first-class ticket won't get you complimentary food other than biscuits, or any drinks other than tea, coffee or juice. The seats are comfortable, though, and the power points seem to work throughout the journey (on some other trains, I've found my laptop running off battery power an hour into the journey, despite being plugged in). Shortly after 10 and some distance out of Peterborough, the train stopped in its tracks outside a perfectly unexceptional-looking town, replete with industrial estates, big-box shopping centre and, in the distance, a church spire holding court over Victorian semi-detached chimney pots. An announcement came on on the PA, saying that the train ahead of ours on the line had collided with "a herd of cows", and the estimated time of departure was unknown. Half an hour later, workers apparently finished removing bits of hamburger from the tracks and the unfortunate train ahead managed to limp into the next station, Newark North Gate, and so we got moving, with the guards announcing that we will be making an extra stop at the next station to pick up passengers from the stricken train. The train is expected to be an hour late pulling into Glasgow. There are no comments yet on "London to Glasgow"